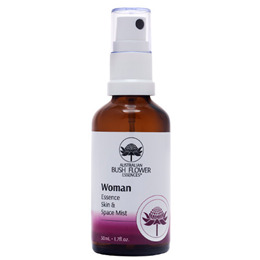 The Woman Mist is a gentle, deeply feminine mist. It is a wonderfully nurturing formulation to pamper, cleanse and tone your skin. Its exotic nature will help to rebalance a woman’s emotional energies. Organic Aloe barbadensis leaf juice, Organic alcohol, Organic glycerin, Aqua, Polyglyceryl-10 Laurate*, Glycerin*, Rosa damascena (Rose) flower oil, Lavandula angustifolia (Lavender) oil, Pelargonium graveolens (Geranium) flower oil, Citrus aurantium bergamia (Bergamot) fruit oil, Planchonia careya essence, Callistemon linearis essence, Epacris longiflora essence, Crowea saligna essence, Styphelia triflora essence, Ptilotus atripicifolius essence, Banksia serrata essence, Leptospermum squarrosum essence, Actinotus forsythii essence, Casuarina glauca essence, Chamomilla recutita (Matricaria) flower extract, Calendula officinalis flower extract, Organic Arnica montana flower extract, Echinacea purpurea root extract, sodium anisate*, sodium levulinate*, potassium sorbate, citric acid*, citral^, citronellol^, geraniol^, limonene^, linalool^. 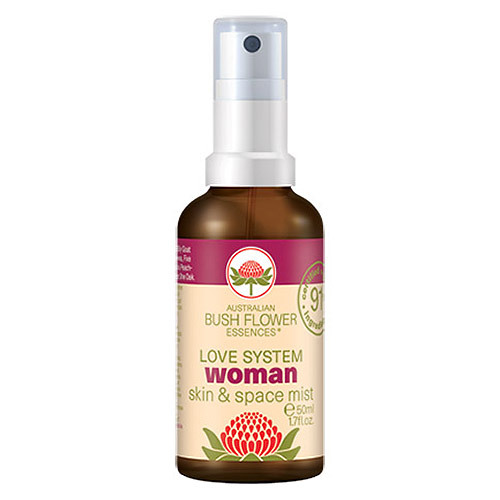 Below are reviews of Australian Bush Flowers - Woman Mist - 50ml by bodykind customers. If you have tried this product we'd love to hear what you think so please leave a review.